The freshman Indiana State University application is for entering freshmen who are (or soon will be) high school graduates and have not attended another college after graduating from high school. 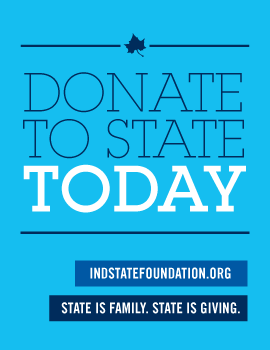 High school students may apply to Indiana State University any time after completion of their junior year in high school. For application types other than Freshman, please see this page. Official High School Transcripts. To be official, transcripts must be sent directly from the high school to Indiana State University electronically or through postal mail. A final high school transcript will be required upon graduation and completion of all high school course work. Official SAT or ACT scores. The newly designed SAT was administered March 5, 2016. These scores, along with any prior scores, will be accepted for admission. Military credit. To receive credit for military education, applicants must submit a DD214 and a Joint Services Transcript (if security message appears when visiting this link, follow the instructions to continue to the Web site). EXCEPTIONS: SAT/ACT scores not required if the applicant is 21 (or more) years of age. Official GED scores may be substituted for high school transcripts. To ensure full consideration, application materials must be received before the following dates. Early application is encouraged for scholarship considerations. Applications received after these deadlines will be accepted and every attempt made to ensure consideration for the desired semester or term. EXCEPTIONS: Indiana Core 40 (or equivalent) not required if high school diploma was awarded prior to 1998. ISTEP not required if high school diploma was awarded prior to 2002. Acceptable GED scores may be submitted to satisfy admission requirements listed above. Note: Candidates who do not achieve the levels (listed above) will be reviewed individually, with consideration given to: standardized test scores; the difficulty of the student's high school curriculum; grades earned in academic subjects; and other evidence that the applicant has the potential for success in university studies. The admission of applicants older than the traditional college age will be determined individually, with special attention given to employment experience and motivation. A limited number of students may be admitted conditionally if they agree to follow a prescribed course of study and advisement.